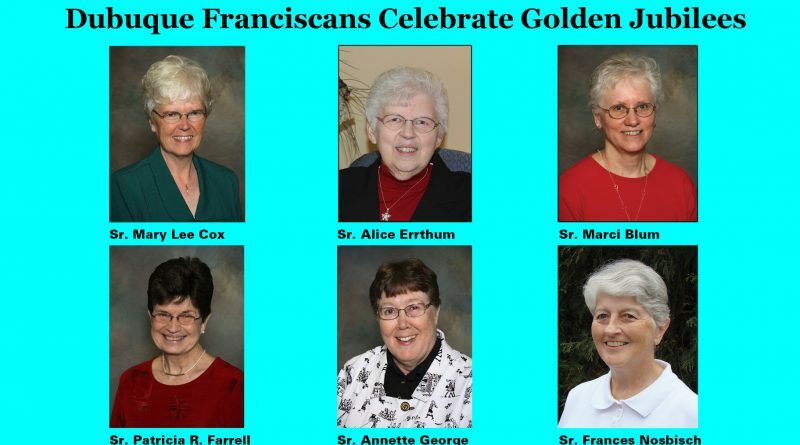 DUBUQUE – The Dubuque Franciscan Sisters will honor their golden jubilarians (50 years) at a celebration on June 25 at Mount St. Francis Center. 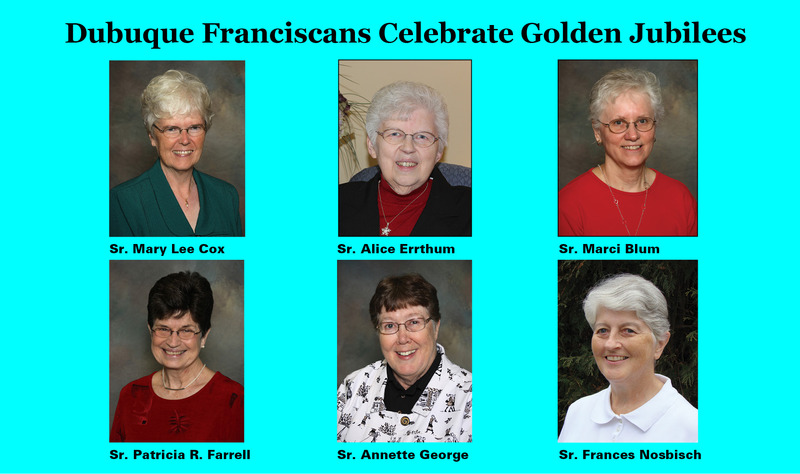 Six sisters will celebrate golden jubilees at a eucharistic liturgy on Saturday, June 25, at 11:30 a.m., at Mount St. Francis Chapel. 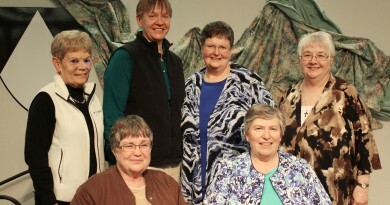 Golden jubilarians are: Sisters Marci Blum, Mary Lee Cox, Alice Errthum, Patricia R. Farrell, Annette George and Frances Nosbisch. Sister Marci Blum was born and raised in Sioux City, Iowa. She is the fourth child of the late Edwin and Ina (Bauerly) Blum. She entered the Sisters of St. Francis in Dubuque in 1965. She made final profession in 1975. Her ministries include teaching at St. Christopher’s School, Midlothian, Illinois; Sacred Heart School, Dubuque; and Corpus Christi School, Chicago. She then served in religious education and adult faith formation in Minneapolis at St. Timothy’s and St. Elizabeth Ann Seton. 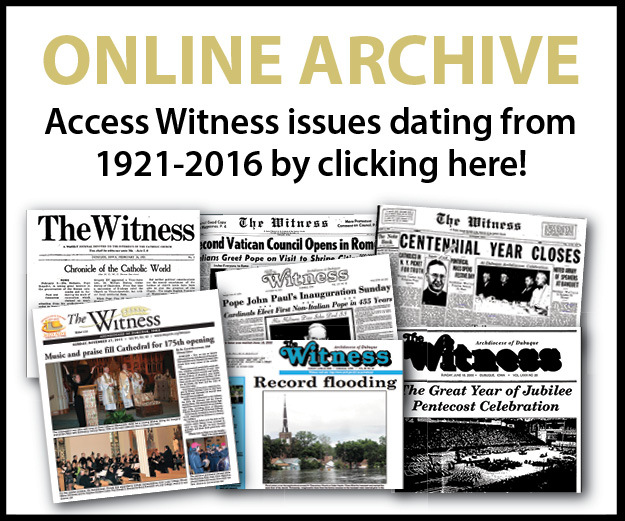 Later she served at the Archdiocese of Dubuque in lay formation, minis­try to persons with disabilities and adult faith formation. She also served as a member of the Dubuque Franciscan’s Leadership Team. Currently she is a spiritual guide and director of Shalom Spirituality Center, Dubuque. Sister Mary Lee Cox was born to Lee Elmer and Edna Mary (McGrane) Cox in New Hampton, Iowa. She has seven siblings. She attended St. Mary’s School Elementary and High School in North Washington, Iowa. Sister taught in Arcadia, Iowa; Dubuque; Greenwood and Jackson, Mississippi; and Sioux City, Iowa. She was principal at St. Theresa’s School, Jackson. She most recently served as a consultant to Catholic Schools in the Archdiocese of Castries, St. Lucia, and also worked with the poor and homeless. Currently she ministers at Opening Doors in Dubuque. “With a grateful heart I celebrate this golden jubilee for I have been blessed by our loving God with beautiful sisters in this community and my loving family and friends. Each mission experience was a blessing and an opportunity to experience God’s unconditional love,” she said. Sister Alice Errthum was born on March 12, 1947, in Holy Cross, Iowa, to Anthony and Anna (Meyer) Errthum. She was taught by the Dubuque Franciscans all 12 years at Holy Cross and had some special sisters that encouraged her vocation to religious life. Alice served at Holy Family Hall and Mount St. Francis in food service. She was at Jesup for two years followed by a ministry in cosmetology at Stonehill Franciscan Services beauty shop where she still serves. “I have met many beautiful sisters and lay people in my life. Jubilee is a special time of blessings and grace for which I am most grateful,” she said. Sister Patricia “Pat” R. Farrell is the daughter of Robert and Rosella Farrell, originally of Manchester, Iowa. Entering the Dubuque Franciscans in 1965, she completed a BA in English at Briar Cliff University, and worked in religious education in Calhoun County, and taught at Beckman High School in Dyersville. She served Spanish-speaking people in San Antonio, Texas; Arica, Chile; and Suchitoto, El Salvador. With a master’s degree in social work from Loyola University Chicago, she did community-based mental health work in Chicago, Omaha and El Salvador. She served locally on the leadership team of the Dubuque Franciscans and nationally as president of LCWR, the Leadership Conference of Women Religious. She now lives and works in Gracias, Lempira, Honduras. “I am abundantly grateful for my 50 years of religious life!” said Sister Pat. Sister Annette George is the youngest of eight girls born to Albert and Ann George in Fort Dodge, Iowa. After graduation from Briar Cliff University, Sioux City, Sister entered the community in 1965, was received in 1966, and made final vows in 1974. She taught physical education at Sacred Heart and St. Mary’s in Dubuque, while also teaching physical education to the congregation’s novices. She also taught physical education while coaching track and field at Beckman High School in Dyersville, Iowa; and physical education at Briar Cliff University, where she also coached women’s basketball. Sister has also ministered as a counselor at Kuemper High School, Caroll, Iowa; as rector of Lewis Hall, University of Notre Dame, Notre Dame, Indiana; and was part of the Campus Ministry Team at Quincy (Illinois) University. 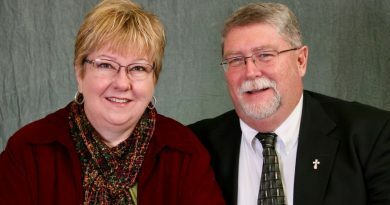 From 1986-1992, she was part of the congregation’s Leadership Team. 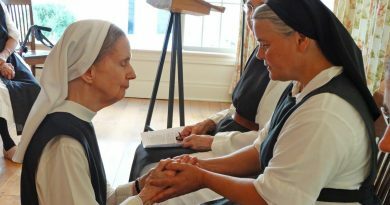 She most recently served the infirmed sisters at Clare House at Mount St. Francis. Sister Frances Nosbisch was born Sept. 7, 1947, to John and Florence Nosbisch in New Hampton, Iowa. She attended grade and high school at St. Mary’s in North Washington, Iowa. Her years as teacher and pastoral minister have taken her to Holy Cross, Algona, LeMars, Sioux City and Iowa City in Iowa; St. Cloud, Minnesota; Boston; Tanzania, Africa; Quin­cy, Illinois; and to St. Lucia in the West Indies where she is currently the director of the Cardinal Kelvin Felix Archdiocesan Pastoral Centre. She is very grateful to her family for their continued support of her vocation, to her Franciscan Sisters and to the many persons she has met in so many places of ministry. Her experiences in Tanzania and in St. Lucia have expanded her view of the church throughout the world.